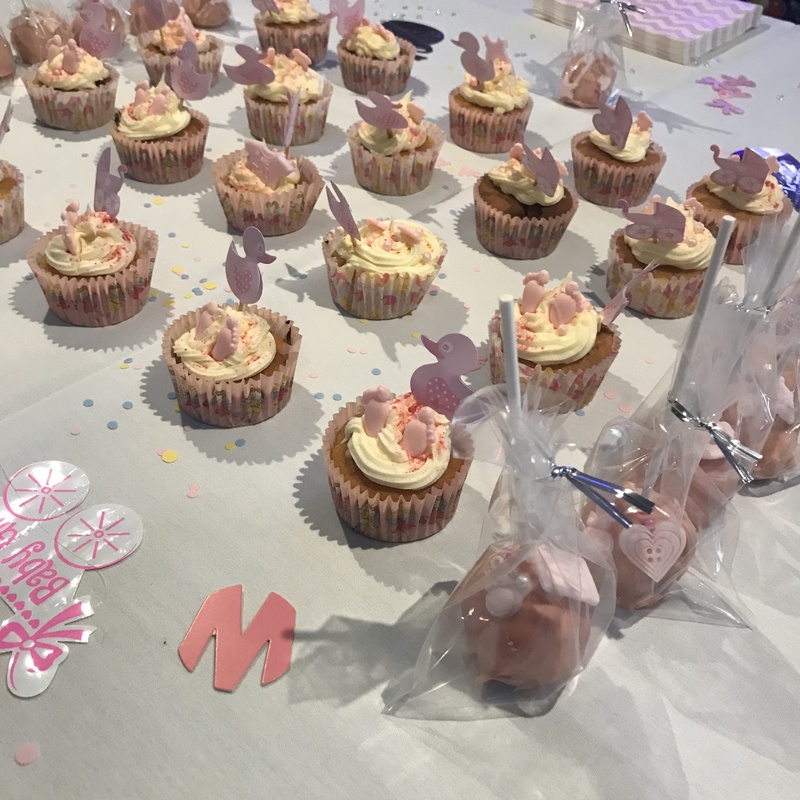 I wasn’t actually going to put this post up as I didn’t get any pictures of me actually making the cupcakes, I only have the final result. YES MY SISTER IS GOING TO BE A MUM. 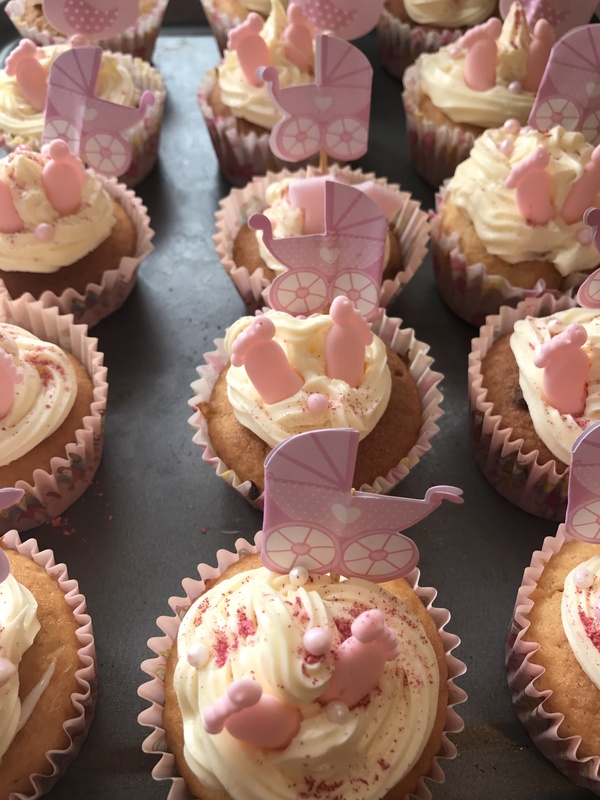 SHE HAD AN AMAZING BABY SHOWER AND I MADE HER SOME CUPCAKES. If you have this sort of event coming up and you want to make cupcakes, then I have the perfect recipe for you. 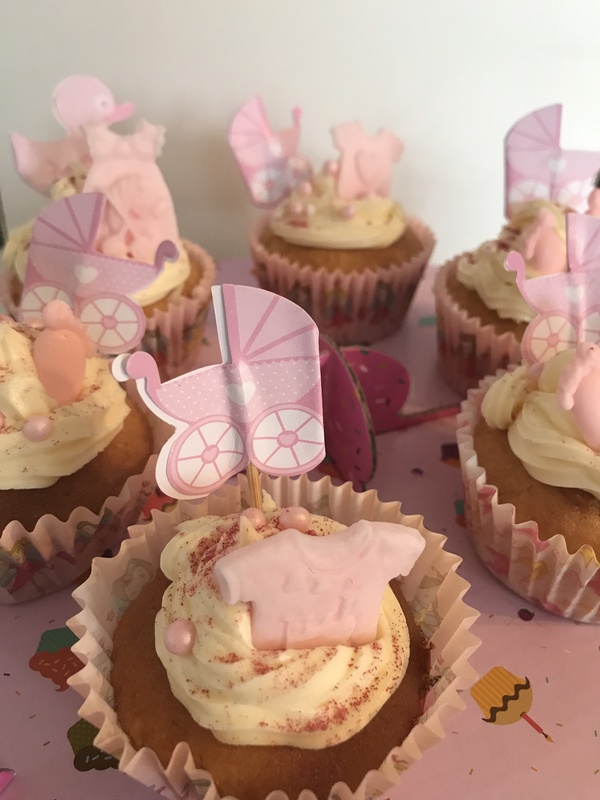 I made white chocolate and rose cupcakes as the theme of the baby shower was pink and white and I thought these went nicely together. The sponge has white chocolate chips inside and the icing is rose flavoured. Any decorations that you want to use. Step one- Preheat the oven to 175oc. Add the butter and sugar together and mix until it becomes a pale yellow/white colour. Step two- Sift in the flour and baking powder. Then add the eggs and Vanilla essence. Fold together and mix until all ingredients are well combined. Step four- Place the tray in the oven and bake for 15-20 minutes, until golden brown. When you poke a skewer inside it should come out clean, try a couple of times as this could be the white chocolate chips melted inside. Step five- Once baked place on a wire rack and leave to cool until completely cooled down. Step one- Mix together the icing sugar, the butter and the rose essence until well mixed together. Step two- Add all of the cream cheese in one go and beat together until it is well combined. Continue to beat together until the mixture is light and fluffy. Step three- Pipe the icing onto the cupcakes only when the cupcakes are completely cooled down. If they are still hot the icing will melt. The cupcake cases were really cute and ideal for my sisters baby shower. I hope you enjoyed this post. I had so much fun making them and I think they looked amazing. What do you think of them? These look so cute and they sound amazing! These are so cute! 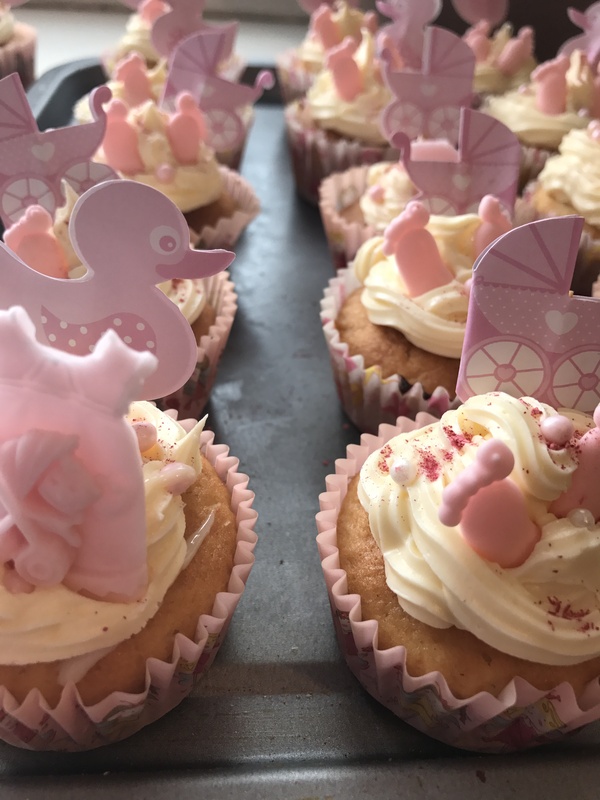 I don’t have a baby shower (or anything baby themed for that matter) but I’ll definitely be trying them out! I hope they look as good as yours! Wow these are gorgeous! I’ll have to try these out one day! I seen these on your instagram, the little duckies are adorable!! wowowowowow!!! Those look amazing!!!!!! Where did you get the decor from? Thank you!!!! I got them from everywhere haha. The Range, Tescos, and B&M! they do some amazing things! Well aren’t these just the cutest things! 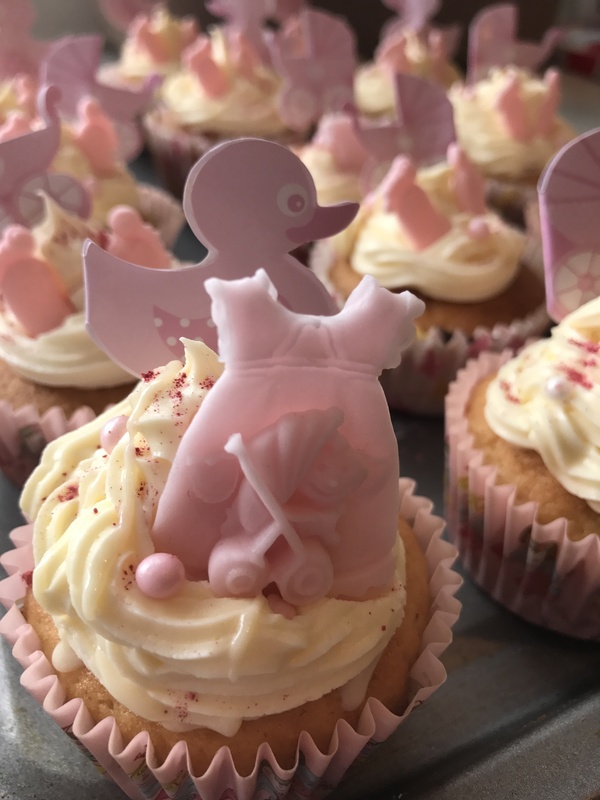 these cupcakes are so amazing …. great post keep updating..